"A CRY FROM GOD'S CHILD"
IF I CAN JUST GET 1 MILLION OR MORE PEOPLE TO DONATE $1 DOLLAR (AND UP) I CAN GET THE HELP I NEED......YOU CAN DONATE ON THIS WEBSITE OR GO TO MY ACTUALLY UPDATED WEBSITE TO LEARN MORE ABOUT MY ILLNESS AND ALSO FIND OUT THE MANY DIFFERENT WAYS ON HOW TO DONATE......THE WEBSITE IS: WWW.SAI-FOUNDATION.COM ....THANK YOU FROM THE BOTTOM OF MY HEART.... GOD BLESS!!!!!!!!! 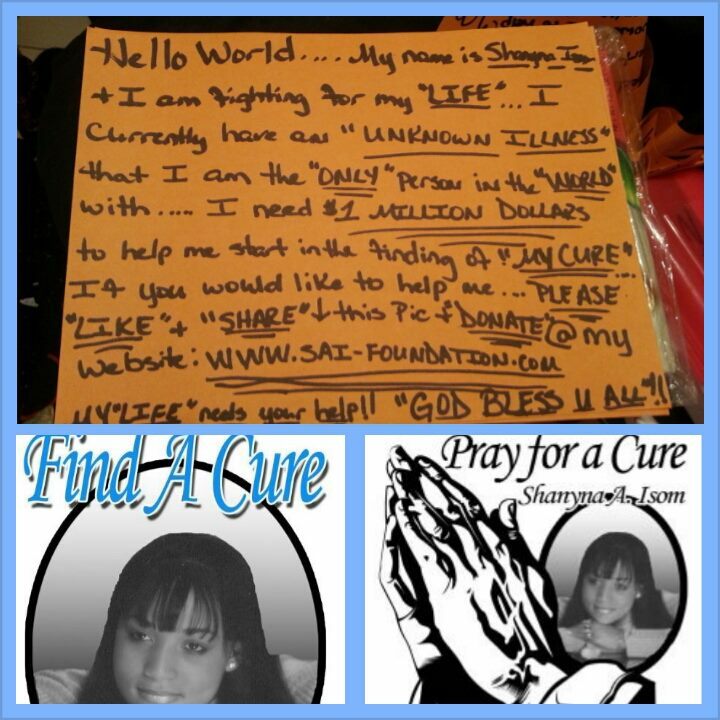 "HELP SAVE A LIFE TODAY!!!!!! !